Get breakfast & premium Wi-Fi at participating Conrad Hotels & Resorts! Save up to 15% off when you book early at thousands of Hampton by Hilton. Book early & save big! Save up to 20% with DoubleTree by Hilton, when you plan ahead! Promotional rates in conjunction with Hilton partners or certain corporate marketing offers. 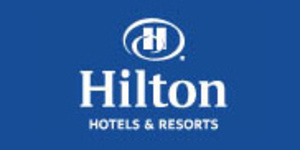 With more than 4,700 hotels, resorts and timeshare properties comprising more than 775,000 rooms in 104 countries and territories, Hilton has defined the hospitality industry and established a portfolio of 13 world-class brands, including its flagship Hilton Hotels & Resorts brand, which is the most recognized hotel brand in the world.